Capitanata olim Mesapiae et Iapygiae pars. This is a magnificent c. 1630 map by Willem Blaeu represents the Capitanata or Puglia Tableland in eastern Italy. This area is often associated with the 'spur of the boot.' This highly decorative map in a fine example of the Blaeu style with multiple decoratie cartouches, sailing ships navigating the sea, and beautiful attention to detail. Principal cities depicted are Foggia, Cerignola, Benivento, Andria, and others. Willem Janszoon Blaeu (1571 - October 18, 1638), also known as Guillaume Blaeu, was a Dutch cartographer, globemaker, and astronomer active in Amsterdam during the late 16th and early 17th centuries. Blaeu was born in Alkmaar, North Holland to a prosperous herring packing and trading family of Dutch Reformist faith. As a young man, he was sent to Amsterdam to apprentice in the family business, but he found the herring trade dull and instead worked for his cousin 'Hooft' as a carpenter and clerk. In 1595, he traveled to the small Swedish island of Hven to study astronomy under the Danish Enlightenment polymath Tycho Brahe. For six months he studied astronomy, cartography, instrument making, globe making, and geodesy. He returned to Alkmaar in 1596 to marry and for the birth of his first son, Johannes (Joan) Blaeu (1596 – 1673). Shortly thereafter, in 1598 or 1599, he relocated his family to Amsterdam where he founded the Blaeu firm as globe and instrument makers. Around this time, he also began issuing separate issue nautical charts and wall maps – which as we see from Vermeer's paintings were popular with Dutch merchants as decorative items – and invented the Dutch Printing Press. As a non-Calvinist Blaeu was a persona non grata to the ruling elite and so he partnered with Hessel Gerritsz to develop his business. 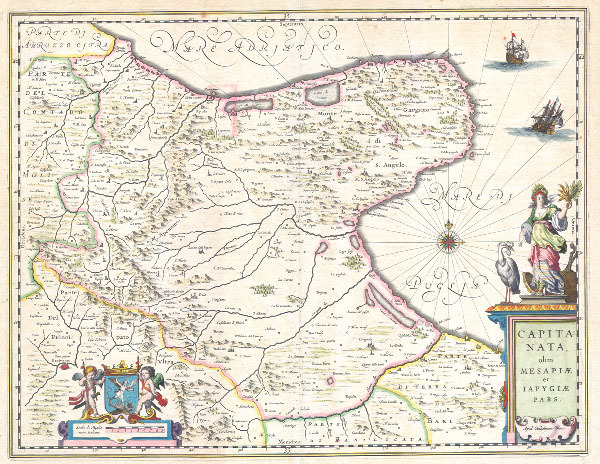 In 1619, Blaeu arranged for Gerritsz to be appointed official cartographer to the VOC, an extremely lucrative position that that, in the slightly more liberal environment of the 1630s, he managed to see passed to his eldest son, Johannes. In 1633, he was also appointed official cartographer of the Dutch Republic. Blaeu's most significant work is his 1635 publication of the Theatrum orbis terrarum, sive, Atlas Novus, one of the greatest atlases of all time. He died three years later, in 1638, passing the Blaeu firm on to his two sons, Cornelius (1616 - 1648) and Johannes Blaeu (September 23, 1596 - December 21, 1673). Under his sons, the firm continued to prosper until the 1672 Great Fire of Amsterdam destroyed their offices and most of their printing plates. Willem's most enduring legacy was most likely the VOC contract, which ultimately passed to Johannes' son, Johannes II, who held the position until 1617. As a hobbyist astronomer, Blaeu discovered the star now known as P. Cygni. Fine or perfect condition. Original fold, as issued. Hand color. Plate-mark visible. Text on verso.